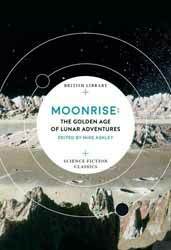 Moonrise: The Golden Age of Lunar Adventures (2018. 348 pages), edited by Mike Ashley is a collection of short science fiction tales all based around the moon. The book is a companion piece to the collected short stories focused on the planet Mars (Lost Mars: The Golden Age of the Red Planet). The book has an insightful twenty-four-page introduction detailing some of the history around lunar stories. It also provides a brief introduction to each of the stories. Dead Centre (1954) by Judith Merril is quite a disturbing short story and unique in this collection. Merril’s interest is not in the heroics which colonisation may entail or the daring rescue of a lost Astronaut, rather Merril turns her gaze on those who have been left behind. When Jock sets off for the moon, he leaves behind his wife and son, Toby. When things go wrong with his mission a rescue is mounted, but the emotional toil on his wife lays heavy as she tries to shield her son from the truth that his father may not return. Unlike many of the other tales where dire adversity is overcome at the last minute, the story ends on a tragic note. A brave choice when at the time most of science fiction was still heavily influenced by the golden age writers like Asimov, Heinlein and Clarke. A Visit to the Moon (1901) by George Griffith followed the trend for science romances, in the vein of H. G. Wells. Professor Rennick discovers how to separate the forces of attraction and repulsion. Using these participles, he can create a craft that can break free of the Earth. What follows is a fanciful honeymoon trip to the moon. What they find is a satellite with an atmosphere and the bleached bones of a dead civilisation. Sunrise on the Moon (1894) by John Munro is less of a straight story, more of a contemplation as the central protagonist looks back on his native planet while at the same time musing about the history of the moon. There can barely be a collection of Lunar stories without a contribution from H. G. Wells. First Men in the Moon (1901) was originally serialised in The Strand Magazine and this represents just one of the short stories which would make up the book. These chapters come near the end of the larger work with Cavor, trapped on the Moon sending back information about the Selenite civilisation. It's classic Wells, chock full of fanciful speculation which the Apollo missions would bury for dead. Sub-satellite (1928) by Charles Cloukey is interesting for several reasons. It tells a tale of the first ship to reach the moon. Unfortunately, the two explorers discover a stowaway who means to kill them. The importance of the story is in its concentration on scientific rigor. Long before workable rockets were created Cloukey saw that more than one form of propulsion was going to be needed to escape earth's gravity. In this case the ship launches like a plane to gain height and save on fuel, very similar to Virgin’s Spaceship One. Likewise, and without spoiling the twist in the tale, the denouement tries to remain faithful to celestial physics. Swinging back from science to science romances we have Lunar Lilliput by William F. Temple. Here brave voyagers discover that the moon has a very thin atmosphere, but enough to sustain a civilisation of miniature creatures. Where they come from and why they appear to be mimicking human civilisation is the heart of the story. Nothing Happens on the Moon (1939) by Paul Ernst swings back to a more naturalistic view of what living on the moon would be like. Clow Hartigan is manning the Lunar station. As the only man there, the psychological pressures are great, previous incumbents have gone mad, spouting stories of moving rocks. Such stories quickly get them kicked out of the service. So, when an egg like meteorite crashes into the surface, seemingly to hatch, Clow must not only fight for his life, but also consider whether he can call for help without being thought mad. Gordon R. Dickson is better known for his Hoka, Dragon Knight and Childe Cycle also lent his hand to short stories. If you haven’t caught up with him I recommend the Dorsai novels. In Whatever Gods There Be (1961) a stranded group of astronauts must fix their crashed ship to get home. The only problem is that there is too much weight so someone must stay behind. Idiots Delight (1958) by the great John Wyndham is set in 2044 and three military bases have been set up on the moon, American, Soviet and British. When war breaks out on Earth both the American and Soviet bases go dark. Michael, the base commander, must fend off his rebellious staff while holding out the hope that mankind might yet survive to move out among the stars. The penultimate story, After Judgement Day (1963) by Edmond Hamilton is another story set on the moon where the Earth has been destroyed, this time by a plague. The last two survivors of the moon base wait the return of cyborgs which have been sent out to discover habitable worlds. The last story The Sentinel (1951) by Arthur C. Clarke is a fitting ending to the collection, not only did it form the basis of 2001: A Space Odyssey (1968), but it also brings wonder back into Lunar stories with the discovery of an enigmatic alien object set just under the moon's surface. Who placed it there and for what purpose forms the core of the story. Overall, it’s a good collection of stories which cover the many sub genres of Lunar science fiction.